When your washing machine smells, so do your clothes and laundry room. Tide Washing Machine Cleaner’s unique oxygenated formula helps remove odor-causing residues that build up on the surface of your washer over time. Unlike bleach, vinegar, and baking soda, Tide Washing Machine Cleaner penetrates & lifts away odor-causing residues at their source. HE washers today use less water than traditional washers, which can lead to residues from laundry soils, detergents, and hard-water minerals being left behind in areas you can’t see. For proper care of your machine, use Tide Washing Machine Cleaner once a month to help keep odor-causing residues from causing future odor problems. If your washer already experiences odor issues, use Tide Washing Machine Cleaner once a week for the first three weeks and once a month afterward. Clean clothes start with a clean machine. Happy cleaning! Tide Washing Machine Cleaner cleans in three ways. First, it fights odor-causing residues with a powerful oxygenated bleach system that gets at the source of the odor. Next, it penetrates & lifts away residues and deposits from the surfaces in your washer with specially designed surface-active ingredients. Finally, it freshens your washer and leaves behind a crisp, clean scent. Remove clothing from your washer. Add 1 pouch of Tide Washing Machine Cleaner directly into your drum. Run a normal cycle, selecting the hot water option. Use once a month to help keep your machine smelling clean and fresh. If an odor problem or visible residue area already exists, use 1 pouch of Tide Washing Machine Cleaner per week for 3 consecutive weeks. 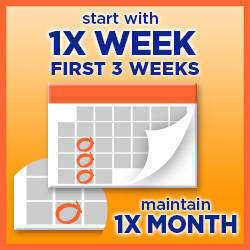 Continue on with just 1 pouch per month as part of your washer’s regular maintenance. 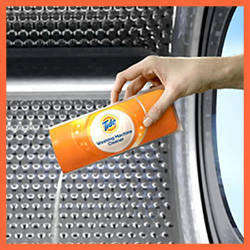 Tide Washing Machine Cleaner is ready for any type of washing machine. It’s compatible with front and top-loading washers and it loves both HE and standard washers. Why do I need Tide Washing Machine Cleaner? Proper care of your machine, which includes once-a-month cycles with Tide Washing Machine Cleaner, helps keep odor-causing residues from causing odor problems down the road. HE washers today use less water than traditional washers, which can lead to residues from laundry soils, detergents and water hardness minerals being left behind in areas you can’t see. How does Tide Washing Machine Cleaner work? Fights odor-causing residues with a powerful oxygenated bleach system that gets at the source of the odor. 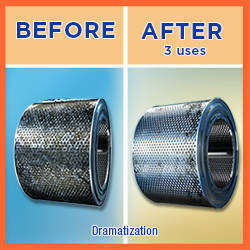 Penetrates & lifts away residues and deposits from the surfaces in your washer with specially designed surface-active ingredients. Freshens your washer while leaving behind a crisp, clean scent. How do I use Tide Washing Machine Cleaner? 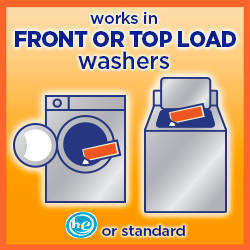 Can I put a load of laundry in with Tide Washing Machine Cleaner? No, you must remove all clothing or other items from your washer before adding Tide Washing Machine Cleaner, to protect your garments and to get the best results. Why is Tide Washing Machine Cleaner a better solution than my homemade cleaning method? Unlike homemade remedies, Tide Washing Machine Cleaner is specifically designed to remove odors from your washing machine using a robust oxygen bleach system. It also contains both polymer and surfactant chemistry, which aids in the removal and disposal of machine residues. So, instead of masking the odor, Tide Washing Machine Cleaner actually helps remove the source of the odor, leaving your machine clean and fresh.